Aircraft and ground-based measurements of aerosol-precipitation interactions in the central Sierra Nevada Mountains (California). It’s not often that we land-lubbers at Sugar Pine get to talk about the airplane, but today we got a great view of it as they flew over us at low altitude. The aircraft team did an extended spiral over our ground site… must have been 6 or 8 circles in all, with a couple of passes straight through the middle over our sampling setup (one of which gave us a pretty ‘intimate’ view of the underbelly of the plane!). I took lots of video, and I’m hoping I can get it edited and put together so I can post here in the near future. 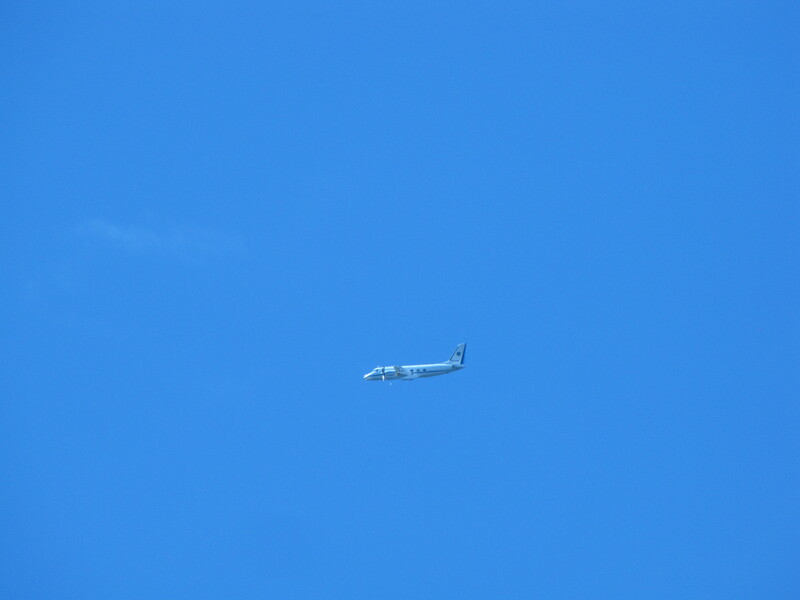 The DOE/PNNL G-1 research aircraft flying a spiral over Sugar Pine Dam on March 5. The spiral path covered a large vertical profile with the ground site in the center. It seems nearly surreal that the study is nearly over… we have about 1.5 days of sampling left before we pack the trailer and head back to San Diego. The last research flights will be tomorrow (Sunday)!! I can speak for those of us at the ground site and say that this is the most adventurous and fun study we’ve done, albeit difficult on the body, dealing with such deep snow and moving equipment in and out of the site (the picture of us moving a pump a few posts back was only the tip of the iceberg!). I think this is the first time the Prather Lab has dealt with snowmobiles, snowshoes, lots of shoveling, walking in snow up to the thighs, and a backhoe to tow us out of the field site. This is most definitely what I signed up for when I joined the lab 20 months ago!! We saw this message on a motorist alert sign on I-80 today heading in the direction of Donner Pass… it seemed appropriate for the situation. 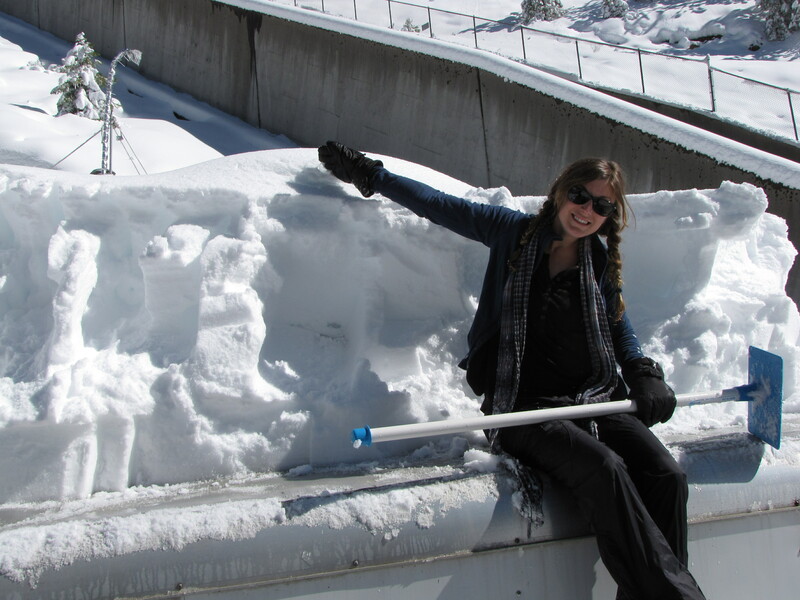 This weekend we had 3+ feet of snow dumped on the field site at Sugar Pine Dam. Things got more interesting with electric service becoming as unpredictable as the weather. 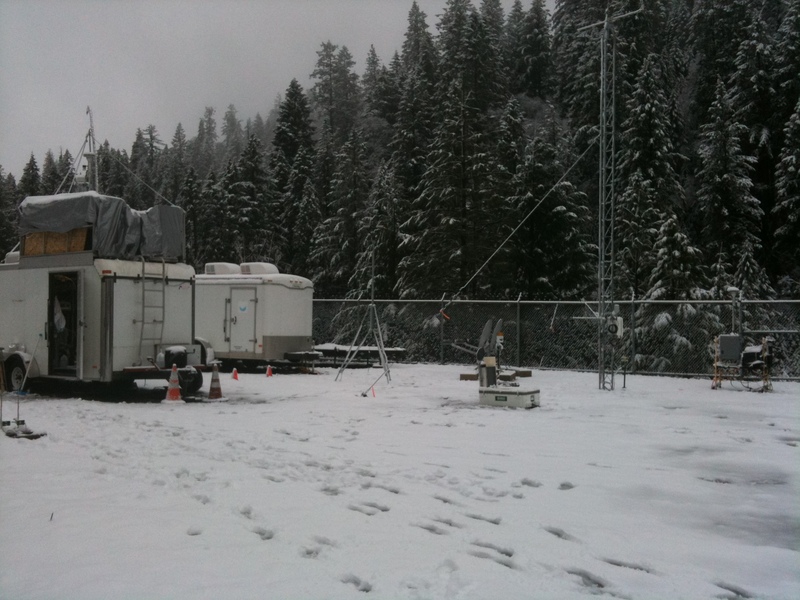 Once we finally felt settled and stabilized our research payload, the Sugar Pine crew got a little snow-related activity in this weekend. Jack and Doug utilize a mountain rescue technique to bring important supplies to the Prather Group's Portable Aerosol Observatory while it's under 3+ feet of snow. Science-wise, we’ve all been very interested in the preliminary results at Sugar Pine. It looks like we’ll be able to present some very interesting findings once we all get our data processed and compared. It’s great to have multiple views of the conditions at our site, with Greg Roberts and Scott Noblitt joining us this year on a day-to-day basis. More SNOW at Sugar Pine! It’s been an incredibly snowy 2 days here at Sugar Pine Dam. Last we saw around noon today, there was about 16 inches of snow on the ground… we’re expecting maybe another foot of accumulation by the time we make it into the site tomorrow. Our exit from the site was about as snowy as I’m comfortable with… we were going to go back in to check our equipment one more time at the end of the afternoon, and decided not to based on quickly deteriorating conditions and daylight. 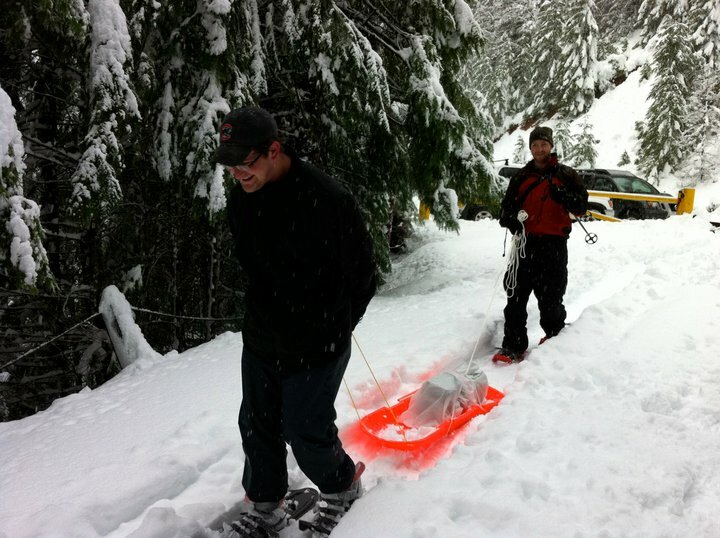 We rented snowshoes for tomorrow…. 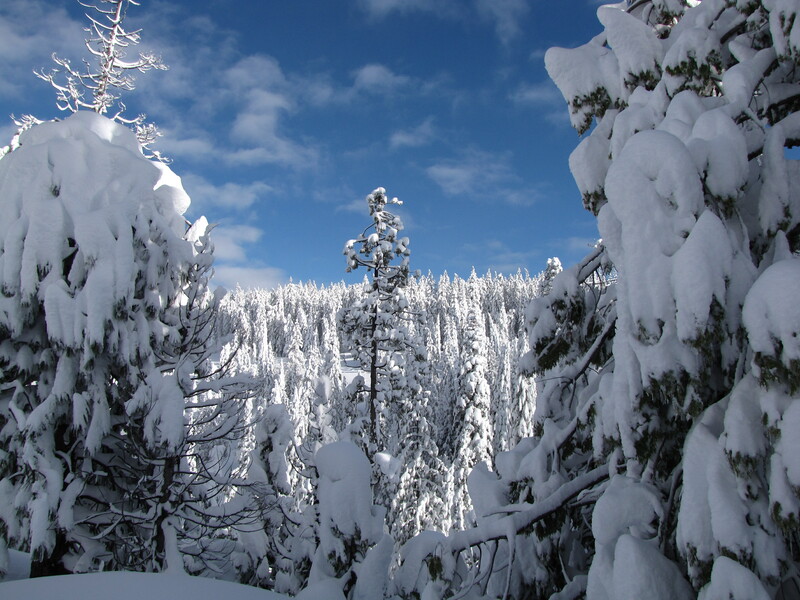 Approximately 12 inches of snow blankets the Sugar Pine Dam field site in the Foresthill, CA backcountry. Well… actually, it’s a lot colder than it was, but who’s counting. 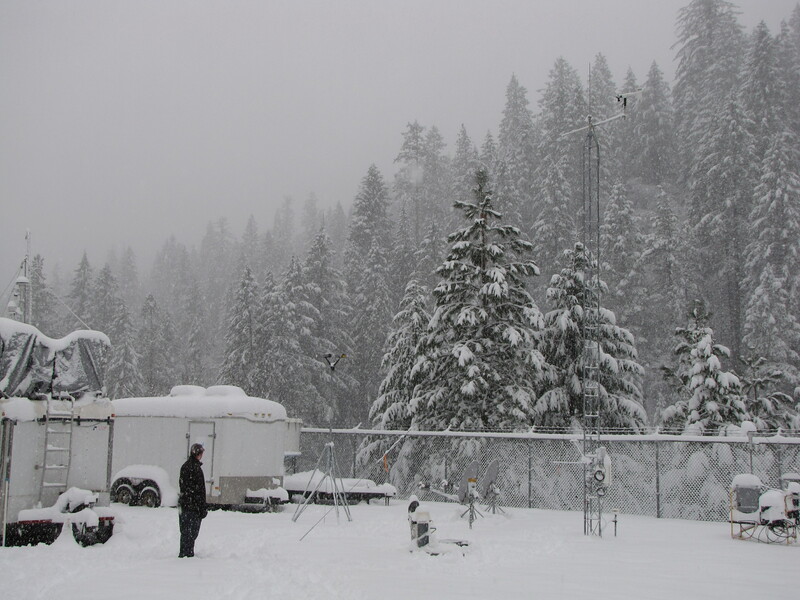 We now have some snow at Sugar Pine Dam — about 2-3 inches. We had to come up early today to get our communications back on line, as snow and satellite uplinks don’t mix well. It’s a good thing we have a substantial 4×4 vehicle. There was a stuck pickup truck on the access road to Sugar Pine Dam… at least it was less serious than when we came upon an overturned Jeep during one of last year’s storms. I never thought we’d actually have to use the chains and the come-along winch we brought along…. this year we’ve managed to not need it (yet!!). 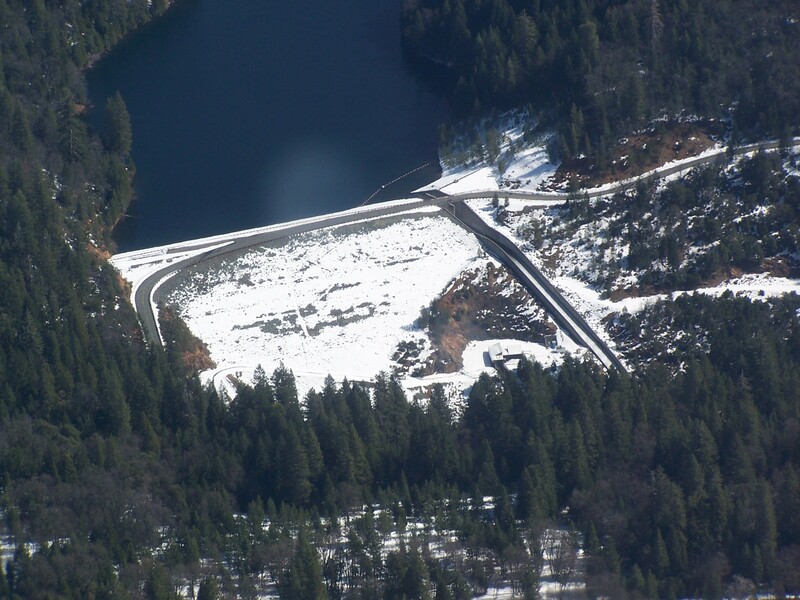 Sugar Pine Dam recieved about 2-3 inches of snow overnight 2/15-2/16. Once we trudged our way into the site, by 4×4 and then by foot at the end, we were able get communications back up and running, check our instruments, bring in the collected slush from overnight for offline analysis, and relay some certainty of the conditions before the G1 aircraft flew over the site (and the rest of the central Sierra), about which I’m sure Kim will have much more to say. We heard them fly over us twice today… they were squarely in the thick cloud deck, but the G1’s twin turbo-prop was clearly audible. As I write to you now, the G1 is flying over the Donner Summit and Norden (home of the Central Sierra Snow Lab… and some really great skiing). We’ve been very excited about our preliminary looks at data, and communicating lots with those back at the aircraft HQ at McClellan Airport. All of our measurements are up and running well at SPD… let’s hope it stays that way! Stay tuned…. What was I saying yesterday about humbling? So after seeing the clouds yesterday, forecasts indicated they should be here today along the coast so we could go out to the coast and sample our first real clouds for this campaign…Guess what! No clouds…they are just out of reach of our flights…I’ve made a sequence of satellite image that perfectly depicts our crazy situation. CalWater: Day 11–The clouds have ARRIVED!! !